(c) Peter Howard, African Natural Heritage. Kahuzi-Biéga National Park encompasses a montane and a lowland area, covered by primary tropical forest that is one of the last refuges of the endangered Eastern Lowland Gorilla. The Eastern Lowland Gorilla (Gorilla beringei graueri) is the largest subspecies of the Gorilla and the largest living primate. They are predominantly herbivorous, eating mostly leaves. They tend to be sociable and very peaceful, living in groups of 5 to 30. A status report on the park provided by the DR of Congo in 2008 mentions 125 gorillas still living in the mountains, and 31 in the lowlands. They are threatend by the high population density, mining and the presence of Rwandan Interahamwe. 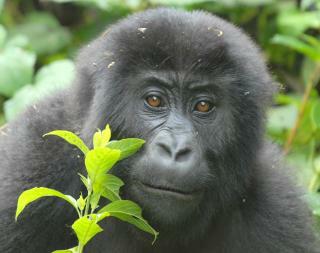 Prior to the conflicts in Congo and Rwanda of the 1990's, an estimated 600 gorillas remained throughout the range. The ongoing fighting in the Congo has moved within the boundaries of the park causing looting, burning of the forest, and poaching of the animals. Consequently the park was added to the list of World Heritage Sites in Danger in 1997. The park is located in the eastern Democratic Republic of the Congo, near to the western side of Lake Kivu and the Rwandan border. It is named after two extinct volcanoes, Mount Kahuzi and Mount Biéga. Kahuzi Biega national covers several varieties of the African wild life. I have visited the park two month ago and it was a pleasure to see Gorilla for my first time. The security situation is becoming better as rebellions are leaving the park and local population have now noticed the importance of the forest. Please if you are reading me and in any kind you can sensitize people around you, tell them that the parks is all left for us as natural places in world filled with big building, industries, modern staff and so on. so please let conserve it. I am a Congolese currently living in South Africa where I am studying Biotechnology at the University of the Western Cape. I am coming precisely from the South Kivu region where the Kahuzi-Biega national Park is located. I leaved in Lwiro where I was doing Biodiversity and Nature Conservation, a degree that unfortunately I didn't finish. In 2005, I went in the Kahuzi-Biega National park several times. This park is a real heritage that our planet still have, to save it or to protect is species both it fauna and flora is to guaranty the humankind a fresh air and new filed of research during this critical time that the planet if facing due to climate change and pollution. Let together save the flora and fauna of the Kahuzi-Biega national park. Thanks to all those who have invested their time and money for the protection and conservation the Kahuzi-Biega National Park. I am a field research working with the neighboring community around The kahuzi Biega National park (KBNP). In the moment we are a running a Centre for Environmental education in Katana. The project aims to achieve long-term conservation of the park by increasing awareness and appreciation towards the KBNP among visitors from urban and peri-urban areas as well as neighboring rural communities. Dealing with the Community based conservation approaches, it targets to establish the basic framework of a regional Environmental Interpretation Service in the Eastern Democratic Republic of Congo. • Build adequate capacity to run the awareness program. The main components of the project consist of Education and awareness campaigns for the local people, preparation of varied resource materials for wider dissemination among all members of the community, including pupils, teachers, as well as researchers, students and in a various non-formal education activities for children above 3 years old, young people and adults, and to increase the capacity building of the park staff and guides and tours operators by means of training. Therefore the Centre seeks to engage a highly trained team to run activities involving technicians in Environmental Sciences, Teachers, Researchers, Ecologists, Artists, as well as Rural development technicians, the KBNP staff. I was born within this park and there are now 13 years, I am working for its conservation through the Pole Pole Foundation (POPOF), a local NGO that we have created to involve local communities in the park's conservation. Since 1996, successive wars started by the eastern DR Congo and have badly affected the park's ecosystem. The mark of this park is that it is an habitat of many endemic species of plants and animals. While efforts are being made to protect the Mountain gorillas in the Virungas, few people around the world know about the other sub-species of the Gorillas that live only in the Kahuzi-Biega national Park region; the Goriila gorilla graueri. Researchers have reported that their population have been declined to 70% the ten years ago. The present state of this World Heritage Site needs more efforts from international and national levels to save some of the remained individuals in the forest. Early Pleistocene: "Straddling the Albertine Rift and the Congo Basin" - "The current course of the Congo River formed 1.5-2 million years BP, during the Pleistocene"
1 Community Members have visited.